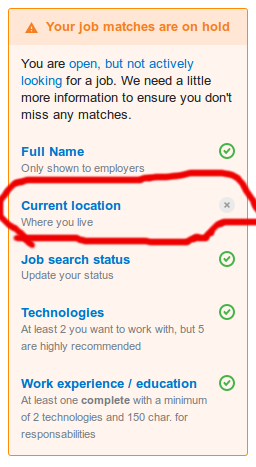 Is there a reason that job matches — whatever that is — should be put on hold, simply because I do not have a location set? I believe not, and I hope that you'll change this. I'm unclear on whether all of the the "Job Match" fields are shared publicly, only with potential employers, or are "private." (At least "Full Name" is obvious, and I'm not worried about the others, except for "Current location".) I do recognize this field from the profile, and thought that it is public. Even for completely remote jobs, employers usually want to know where a candidate is located (the country at the very least). A company may be looking for a remote developer, but they may only want to hire in the US because they don't have the infrastructure for international salary accounting. Or they may be in Europe, and while they're okay with international remotes, they still want a significant timezone overlap with the rest of the team, and thus wouldn't want to hire someone in New Zealand. Or, for various reasons, it may not be legally possible for a company to hire people in certain countries. Long story short, a recruiter looking at a profile expects to see the candidate's location, and that's why until there's something there, the profile won't be shown in employers' search results. Currently the location field in the Developer Story and the location field in the public profile are backed by the same data. For the private beta (where the Dev Story isn't used for employer matching anyway) we decided to live with a warning, but eventually, we'll make it possible to enter two different things, say, a rough location (e.g. country) or nothing at all in the public profile, but a more specific location in the Developer Story (which would necessarily have to be hidden in that case, otherwise it would be pointless). Now, if you're just using your Dev Story to showcase yourself as a developer, but aren't actually interested in being contacted about jobs, none of this matters – in that case, you wouldn't want to hide your Dev Story, but you could be as specific or non-specific about your location as you want in it. But if you have chosen either "I'm actively looking for a new job" or "Not looking, but wouldn't mind hearing about interesting jobs", then we show the "on hold" warning to let you know that right now, you won't be hearing anything because your data isn't as complete as it needs to be for it to be put in front of employers.